If you like Teak, you will love this yacht. All Teak and Holly throughout and the oversize windows add to the big boat feel. She has a 1,000 mile range at 9.5 knots burning10 GPH and super quiet. Complete refit covering every area of the yacht. Just some of the items replaced:AC, Davit, Electronics, Heads, Bow Thruster, Shafts, Props, Plumbing, Fueling Polishing System, LED Lights In and Out, and New Fuel Lines just to name a few. The flybridge has been completely redone from the helm to the Pompanette Captain Chairs.New Teak Tables complete this transformation. The boat deck accommodates a large tender and has a New Hydraulic Davit. The salon is beautiful, with her floor to ceiling refit. You get a full, unobstructed view from the back deck through the front windshield. The pilothouse is open to the galley. The galley is open to the salon. The salon is open to the aft deck. The aft deck is large and comfortable. The master stateroom is aft and completely separate from the other staterooms. Forward is a V-berth cabin with it's own head and TV. The VIP stateroom is amidship, with a walk-around queen bed, also has a kids bunk above it. A huge flat screen TV and a private head complete this wonderful cabin. The engine room is a full stand up. You can walk around the engines. All equipment is very accessible. Great care and thought has been put into the area to insure reliability and redundancy. The batteries have an automatic water system for easy maintenance. United Yacht Sales New Jersey would love to guide you through a personal showing of this 57' Kong & Halvorsen Island Gypsy 57 1982. 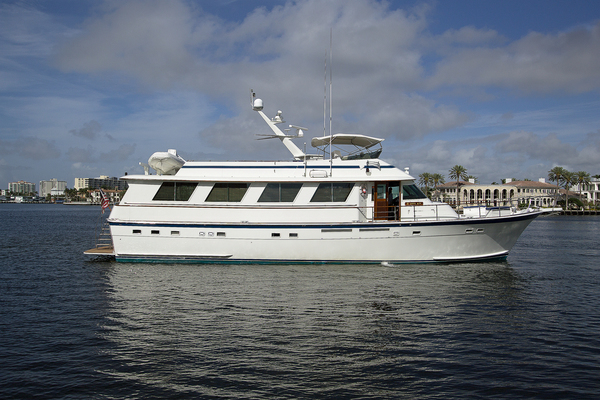 This yacht for sale is located in Bay St. Louis, Mississippi and priced at $390,000. For a showing please contact us by filling out the form on this page and we will get back to you shortly! On deck you have a comfortable seating area on the bow, full walk around decks. Aft you have a large covered dining and lounging area with teak deck and table.The big teak deck cockpit with transom door and ladder make accessing the water and tender a breeze. The Lazarette is very large with an abundance of storage. The electronics are all very modern.Most are new or very recently installed. There is room to stand up, walk around and is very clean.The owner took pride in making a great engine room even better. From the dual generators to the fuel polishing system, new racors, heavy duty battery chargers and new fuel lines. This yacht is ready to go. The Port Engine has been recently rebuilt (Only 790 Hours Since Being Rebuilt).